Whether you need an itinerary for a girlfriend getaway or a handful of options for a lake day with the kids, we have you covered. We planned 12 ways to create your ideal summer day. Summer is all about long days, long sunshine, and filling every moment from your morning coffee through the firefly-lit evenings with a memory worth keeping. While the kids are out of school and the weather is warm, take the time to plan a few oh-so-perfect days. Fill them with fun from morning to night and make this summertime your favorite ever. Whether you need an itinerary for a girlfriend getaway or a handful of options for a lake day with the kids, we have you covered. 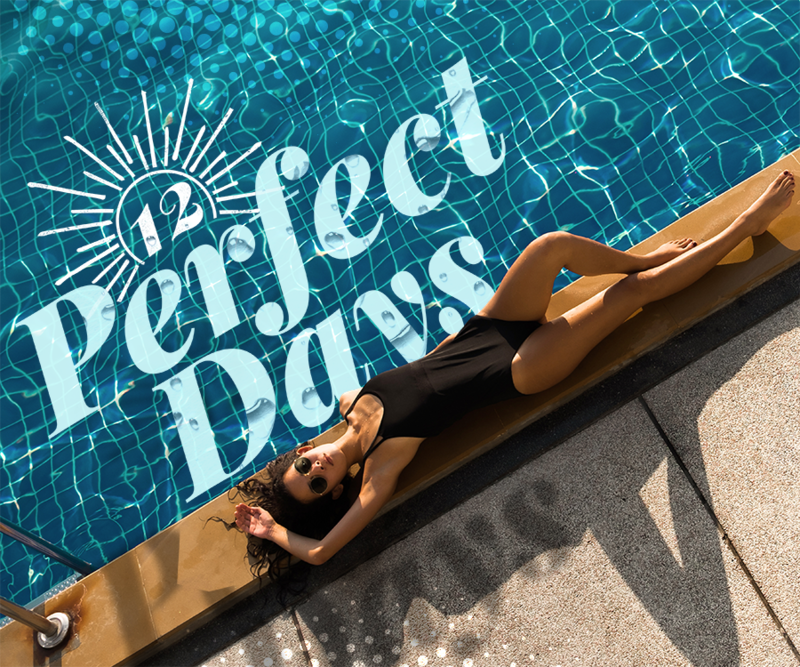 We planned 12 ways to create your ideal summer day. So rip out your favorite page and get going! Dip into your day of cooling off by taking the family to Fassnight Pool. How many pools and frozen treats can you fit into one day? Take the kids along for the fun and find out. 1️. Start your day of pool hopping at Fassnight Pool (1300 S. Campbell Ave., Springifeld) for a fun and relaxing cool-down. Pools are open from 1 to 6:30 p.m., so head there after lunch. Located inside shady Fassnight Park with it’s charming stone bridge and structures, Fassnight pool has two diving boards, a slide and a separate kiddie pool. Kids 2 and younger are free with an adult; entry cost is $2.50 for kids ages 3 to 17 and $3 for adults. 2. From Fassnight Pool, head south on Campbell Avenue to grab your first frozen treat of the day at Andy’s Frozen Custard (2726 S. Campbell Ave., Springfield). Andy’s serves a tasty menu year-round but also serves up seasonal specials such as blackberry-, strawberry-, key lime pie– and peach-flavored desserts. 4. Swimming will wear you out—and make you hungry! It’s time for another frozen treat. It wouldn’t be summer if you didn’t stand in line for a Pineapple Whip. There are three locations in Springfield, but the closest is at 1517 W. Battlefield Road. Pineapple is always on the menu, and other flavors (strawberry-kiwi, mango-peach and more) rotate in and out weekly. Closed Sundays. 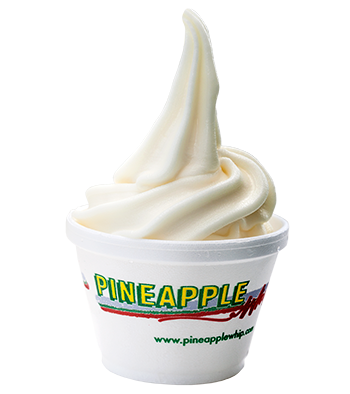 Check out the website at pineapplewhip.com or call 417-207-3975. 5. You’re already on the west side of town, so head out to Republic and check out the Aquatic Center (711 E. Miller Rd. ; 417-732-3575). Admittance is $5 plus $2 if you want to ride the Huna Flowrider Surfing Simulator. Kiddos must be at least 42 inches tall and have a parent’s consent to ride. The corkscrew and speed slide are also fun for kids 48 inches and taller. There is a zero-degree entry here for the little ones, too. 6. Finish your day with one final frozen treat: Hawaiian Shaved Ice. Sheri’s Shaved Ice (1450 S. Glenstone Ave.) serves more than 30 flavors, including fan favorites such as Cherry, Fuzzy Navel, Tiger Blood (red in color, tastes like strawberry and coconut) and Bahama Mama. You can also bring your dog along and treat him to some Pup-Ice—a special icy treat made just for your furry friends! Closed Sundays. Follow Sheri’s Shaved Ice on Facebook. The best time to pick is early in the morning, so it’s time to get going. Don’t forget to wear sunscreen and comfortable shoes. A brimmed hat is also a good idea. Grab your bucket and head out to the fields. 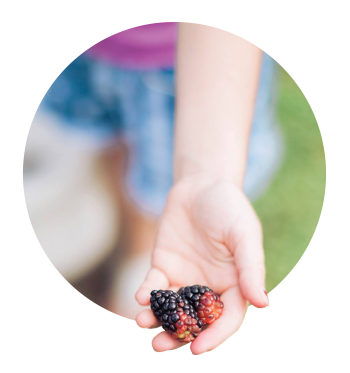 The folks at Persimmon Hill want you to be picky about your berries. Take your time and choose the biggest and prettiest berries. Leave the small berries to grow a bit more. Most folks spend about two hours picking, and if you do the same, you’re probably ready for a break. Head back to the store and cool off with a blueberry lemonade. Browse the packaged products in the store and pick out a few things to take home or give away as gifts. You’ll find berry-filled barbecue sauces, jams, fruit butters and syrups. Shiitake mushrooms are also grown on the farm; dried shiitakes and mushroom sauce are sold in the store. Head back to the fields to pick a few more berries. When you’re finished the folks at Persimmon Hill will weigh them and charge you per pound. All that berry picking has likely made you hungry again. Grab lunch before you go—eat it here or take it with you. Pulled pork sandwiches with one of the berry barbecue sauces are a favorite as well as the shiitake mushroom quesadillas. 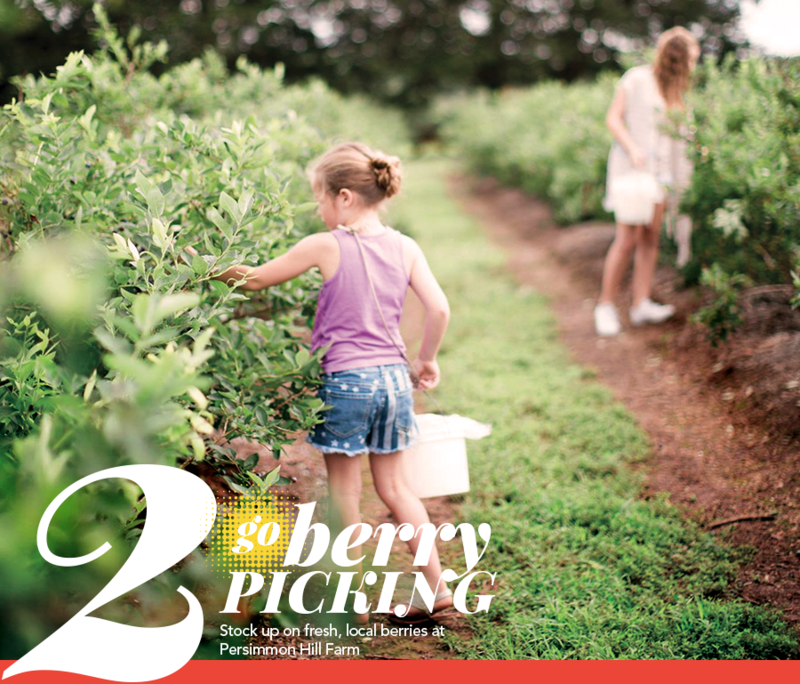 If Persimmon Hill Farm is too far from your neighborhood for a day trip, try some berry picking at one of these other 417-land you-pick farms instead. Be a fan at one of the many sporting events in 417-land. Pick one, and make it the centerpiece of your day, then reserve a Bubble Soccer game to get your sport on yourself. 1. 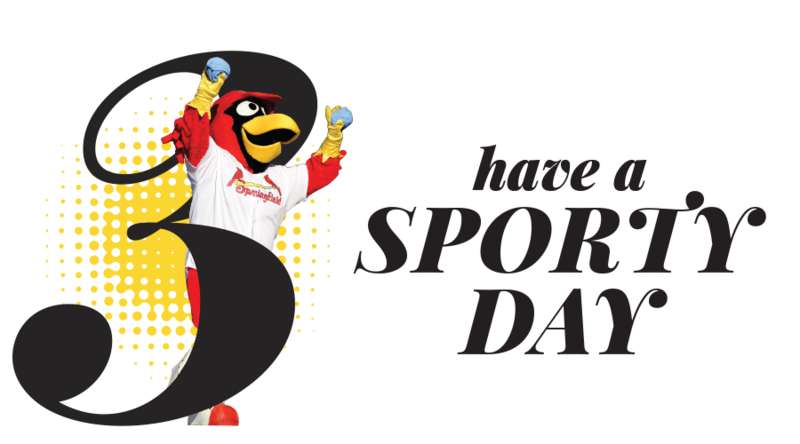 Attend a Springfield Cardinals game. For a lot of folks, summer equals baseball. And the good news is you don’t have to go far to see nine innings (or more) live. Springfield is home to its own minor league baseball team that plays in a scenic downtown stadium (Hammons Field, 955 E. Trafficway St.). Most of the home games are in the evenings, but you can also catch day games. Buy tickets online at milb.com, stubhub.com or at the box office at the stadium. Call 417-863-0395. 2. Did you know Springfield has its own World TeamTennis franchise? And you can be a spectator! The Springfield Lasers play about half a dozen home matches during evenings in July and August at Mediacom Stadium at Cooper Tennis Complex (2331 E. Pythian St.; 417-837-5800). This place is family friendly (no alcohol). Unlike what you see on television, these matches can get rowdy with lots of cheering from the fans and music playing in the background. It’s really fun for the whole family. For dates and more info, visit springfieldlasers.com. 3. See a golf pro in action at the Price Cutter Charity Championship in August at Highland Springs Country Club. This PGA Tour golf tournament raises money for local children’s charities. Purchase tickets online at pricecuttercc.org or call 417-887-3400. 4. Try something new! Stockton State Park Marina offers a sailing school where you can learn to let the wind carry you across the beautiful lake. 5. Try your hand—er, body—at Bubble Soccer. 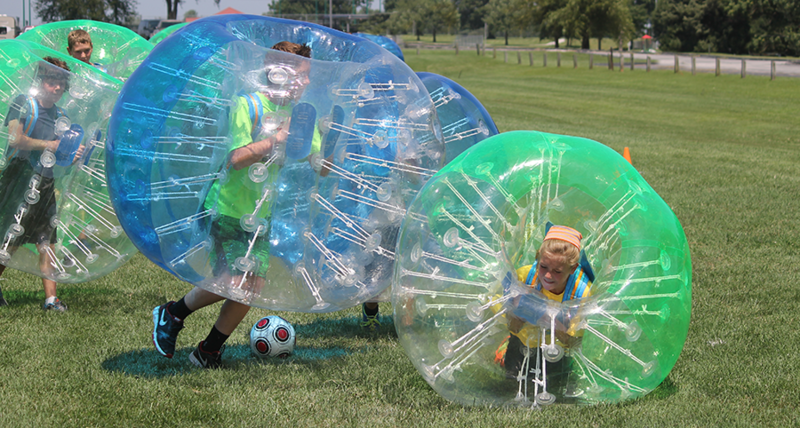 Imagine your upper body in a bubble going head to head with your best buds or family members on the soccer field. This unique, amusing twist on the game is fun for parties, family gatherings or even corporate events. Head to unbelievabubblesoccer.com and search Springfield for more details. Enjoy swimming, hiking, cave-exploring and more! Arrive at Moonshine Beach (133 State Highway 265), the largest and most popular sandy beach on Table Rock Lake. This is as close as you can get to a seashore without driving 12 hours to the Panhandle! This is a nice, clean and popular destination for families. Go swimming, do a little fishing, or rent a paddleboard from a nearby marina and test your paddling skills. After a couple of hours of fun in the water, you’ll probably be ready for a break and a snack. Find a picnic table and unpack your picnic lunch. Sit back and people watch, soak up some sun and take in the gorgeous lake view. Change out of your swimsuit and head over to the Dewey Short Visitor Center (4500 State Highway 165; 501-340-1943), where you can learn all about the construction, inner workings and daily operations of the Table Rock Dam—and entertain your kiddos some more! Special programs start at 2 p.m. daily; depending on the day, you might join in on a nature walk, story time or even a lesson on hydropower. Next to the front desk you’ll find a discovery center where your kids can “go fishing” in a virtual fishing pond using velco worms and then “cook their catch” around a play campsite. They might also like to curl up in the ladybug or frog tent with a book or a coloring sheet. Indoor and outdoor scavenger hunts are ongoing daily, and park rangers hand out temporary tattoos and stickers to kids when they complete the hunt. Want to learn more about the dam itself? Three observation decks allow you to see different levels of the working dam, and picnic tables are set up on the two lower levels. If your kids are old enough to sit through it, take the time to watch the 22-minute video on the construction of the dam. Finally, pick up a map of the Table Rock Lakeshore Trail and the White River Valley Trails before you leave. The visitor center is open daily from 10 a.m. to 5 p.m.
With maps in hand, decide which trail to tackle first. If you feel like taking a leisurely stroll, start out on the Table Rock Lakeshore Trail, a 2.25-mile paved trail that starts at the visitor center, meanders along the lake and ends at State Park Marina. You can also bring bikes and ride along this path. If you make it to the marina, stop in for a Hawaiian shaved ice to cool down before heading back to the visitor center. If you’re up for a bit of a challenge, walk across the street from the visitor center and venture out on any of the four loops of the White River Valley Trails. The terrain here is a little rocky and steep in places, great for trail running, hiking and mountain biking. 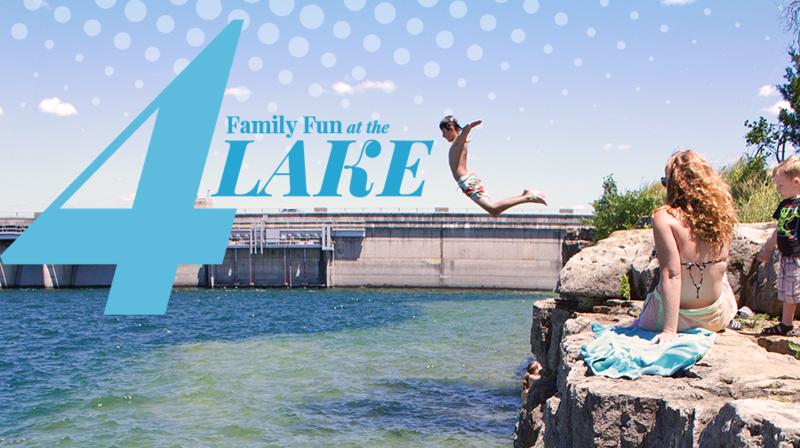 Muster up a little bravery, don some swimsuits, and take the kids to jump off the bluffs near the Dewey Short Visitor’s Center. It’s a scenic little spot and a great swimming hole, and it’s the perfect refresher after a nice, sweaty hike. All that walking, hiking and bluff jumping has surely made you hungry. Head to Billy Bob’s Dairyland for a true old-fashioned diner experience (1901 W. 76 Country Blvd., 417-337-9292). Billy Bob’s is famous for its burgers, milkshakes and malts, chili cheese foot-long hot dogs and fried pies. This famous little diner on the Strip is the perfect way to end your day at the lake. Before heading home, venture into Branson and catch a ride on the famous 15-story Ferris wheel at Track 4 of The Track Family Fun Parks (3345 W. Highway 76; 417-334-1612). 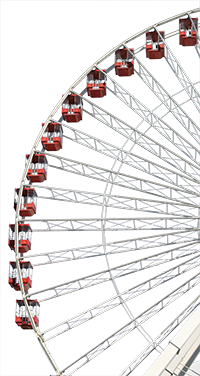 Formerly located at Navy Pier in Chicago, this Ferris wheel has 40 gondolas and can carry 240 passengers at a time. It lights up the Branson sky each night with 16,000 twinkling lights. The Track is open until midnight. Cost to ride the Ferris wheel is $12 per person. At press time, it was scheduled to open late June. For details, visit bransontracks.com. Check out three hot spots for fly-fishing in 417-land. Pick your favorite and make a day of it. Take a drive to Rockbridge where you’ll find world class rainbow trout fishing. You can do this one of two ways: Bring your own rods or schedule a fly-fishing lesson. If you bring your own rods and waders, you can fish in the rapids. 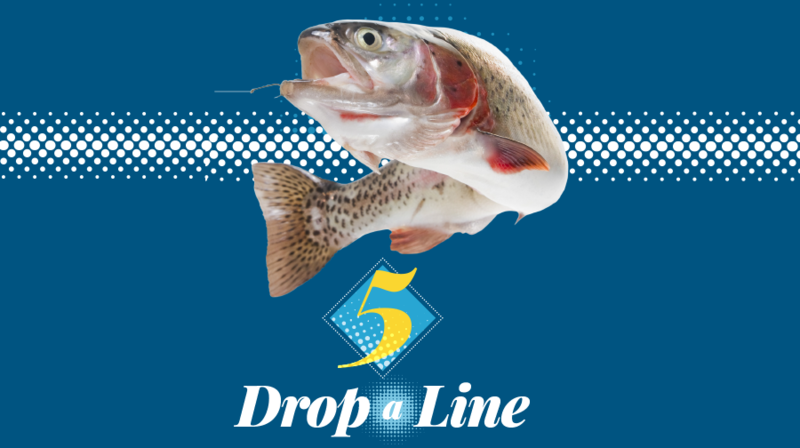 Fishing permits are $25 per person 13 years and older to catch and keep (plus $4.50 per pound for cleaning and packaging of the fish) or $105 to catch and release. If you schedule a fly-fishing class, you will learn how to cast and tie knots from professionals who guarantee you’ll catch fish. Guided catch-and-keep classes are $150 per person (plus the cost of cleaning and packaging the fish) or $275 for catch and release. Lunch is included when you book an excursion. Half-day classes are also available. No matter which option you choose, make sure you grab a drink in the Grist Mill Club while you’re there, and be sure to take home a package of their famous cold smoked trout. Visit rockbridgemo.com or call 417-679-3619. The Orvis Fly-Fishing School at Dogwood Canyon offers one-day schools on June 18, July 30, August 20 and September 17. Cost is $279 per person, and the recommended age for the school is 12 and older. Be sure to dress appropriately for the weather and wear a brimmed hat to shade your eyes and polarized sunglasses to see into the water. Hire a guide and spend the day chasing big fish on the North Fork River. Brian Wise is the head fishing guide for River of Life Farm in Ozark County. You can book a full-day or half-day guided trip with him. Full-day trips are $350 and include lunch, flies and terminal tackle. He specializes in large flies for big fish! If you have a group, be sure to give him plenty of notice, and he can arrange for other guides and multiple boats. To learn more about Brian, visit flyfishingtheozarks.com or call 417-683-0516. 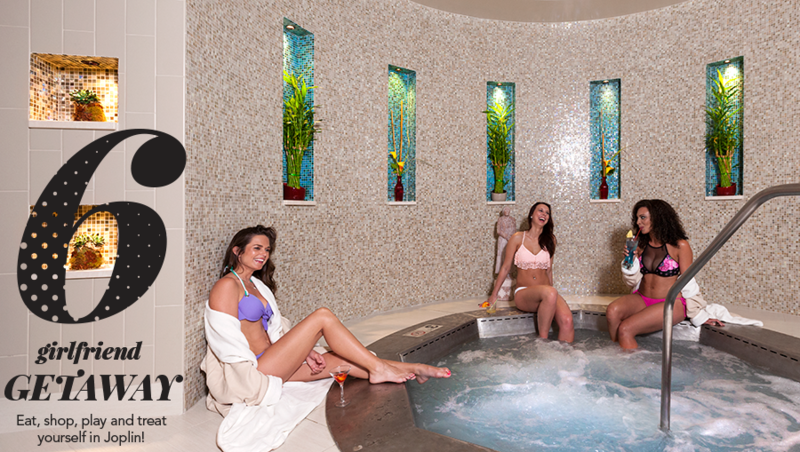 An afternoon spent at Nee Spa in Downstream Casino Resort makes for the perfect pampering. 1. 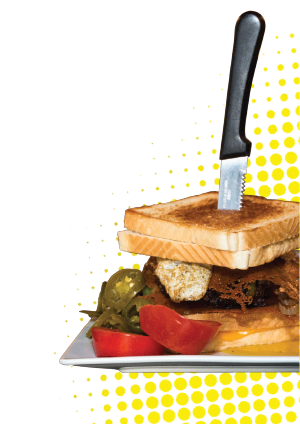 Start your day at the Bruncheonette (424 N. Main St.; 417-781-3447). Open Wednesday through Sunday, this is a lovely little spot for breakfast, brunch or lunch. If you’re undecided after looking at the menu, order the special—no matter what it is, it’s always a favorite. Or choose a staple menu item, like the Benny Harper (English muffin topped with bacon, avocado, tomato, poached egg and hollandaise) or the Pulled Pork Pancakes. If you go for lunch, order the Island Salad: marinated sushi-grade tuna, local greens, pineapple, spicy croutons and vinaigrette. 3. Eat lunch at Instant Karma Gourmet Hot Dogs (527 S. Main St.; 417-206-3647) and then brag about it later. Try the Porklandia: a bacon-wrapped dog topped with an over easy egg and avocado. Or the Double Happiness Burger: two third-pound beef patties topped with cheddar, sautéed onions, jalapeño peppers and tomato and stacked between two grilled cheddar cheese sandwiches. Instant Karma has recently added a new cocktail menu, and happy hour is from 5 to 7 p.m. daily. Download the app to see the real-time beer menu and daily specials. 4. Lace up your sneakers and burn off that whopper of a lunch at the Wildcat Glades Walk, a 3.4-mile loop. Take the paved path for a more leisurely stroll or the non-paved path if you’re up for more of a challenge and some hiking. This is a perfect time to bond and catch up with your girlfriends. 5. Drive about 10 miles west of Joplin, and you’ll find Downstream Casino Resort (69300 E. Nee Rd., Quapaw, Oklahoma), where you and your girlfriends can check into the Nee Spa for some pampering. Choose from massages, scrubs, wraps, facials, pedicures, manicures and more. The Mini Escape Package is a good sampler and only takes about an hour, so you’ll still have plenty of time to hang out in a cabana by the pool or to try your luck in the casino. 6. It wouldn’t be a ladies’ day out without a little shopping. Check out Sandstone Gardens (2826 Douglas Fir Rd. ; 417-206-6305). The 50,000-square-foot showroom also serves as a retail store. Pick up something for your garden, patio or home or just enjoy the beautiful displays and grounds here. The store and the bistro are open Tuesday through Saturday; closed on holidays. Visit sandstonegardens.com. 7. On the way home, stop at the 66 Drive-In Theatre (17231 Old 66 Blvd., Carthage; 417-359-5959) on your way home and watch a movie under the stars. You can bring food but no alcohol, or grab something at the concession stand. The drive-in only accepts cash. Movies start at dusk. Cost is $7 per person. Visit 66drivein.com for current movies and showtimes. 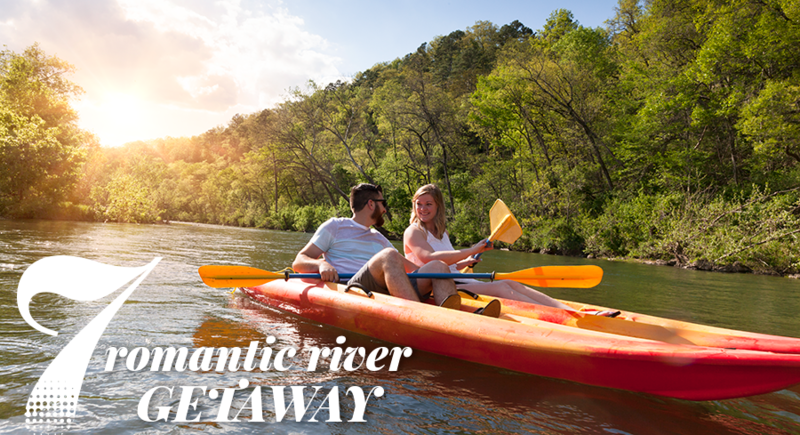 Plan a relaxing and romantic day at the river with your sweetheart. Arrive at Sunburst Ranch (776 CR 352, Caulfield; 417-284-3443), where you’ve booked a canoe rental for an early 7-mile float trip on the North Fork River. The nice folks at Sunburst will get you all set up with a canoe (or kayaks), and you can take off from the Sunburst Landing at your leisure. Plan to navigate a few ripples and drift through some slow-moving water along the way. On this float you’ll see plenty of wildlife and find gravel bars perfect for taking a dip in the refreshingly cool spring-fed water. Just past the low-water Patrick Bridge, pull over on the gravel bar on the left. Take a short hike into the woods to see the famous Althea Spring. If you think the water in the North Fork is chilly, dip your toes in the icy spring water (or be brave, hold your breath and jump in!) for a rejuvenating and breathtaking thrill. Warm up by unpacking and enjoying your picnic lunch on the sunny bank while people watching as other paddlers drift by. When you reach the takeout point (about one mile past the higher James Bridge), hang out on the landing and recap the morning while you wait for your ride. To book your day, head to sunburstranchcanoe.com. Hodgson Mill overlooks an ice-cold spring that feeds a nearby pond. Pick up an Ozark County Mill Tour map from the folks at Sunburst. Grab your camera and set off for Hodgson Mill. (Dawt Mill is closer, but you’ll be there later for dinner, so you can skip it for now.) Set against a bluff on Bryant Creek, Hodgson Mill is one of the prettiest on the tour. Three million gallons of cold water flow from the spring each day, some of which is diverted into a pond, which adds to the lovely scenery surrounding it. Drive five miles south to Zanoni Mill. This is more of a drive-by mill, as it is not open to the public. It is situated near a beautiful white house that has served as a bed and breakfast and hosted many weddings and receptions. Continue south on Highway 181 and follow the map to Rockbridge. Similar to Dawt Mill, Rockbridge Mill is a focal point but is also situated in the center of a busy resort and restaurant. Stop in the Grist Mill Club and have a drink while overlooking Spring Creek below. Hammond Mill is a bit of a drive, so you can choose to skip this one if you’re short on time and head back toward Dawt Mill, where a very special dining experience awaits. Arrive at Dawt Mill (County Road PP318, Tecumseh; 417-284-3540), where you’ll finish off your romantic day at the river with dinner at the Chef’s Table. Chef Ryan Van Winkle is eager to accommodate his guests’ requests. Reservations are strongly recommended, and Chef Ryan encourages folks to make suggestions in advance for the menu. For example, do you love bacon? Chef Ryan can prepare a multi-course meal featuring bacon in every course. How about garlic? It’s been done. He even created garlic ice cream! Many of the fruits, vegetables, herbs and edible flowers Chef Ryan uses in his creations are grown on the property, and he can make suggestions, too, based on what is in season. 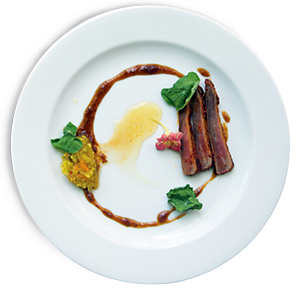 The Chef’s Table requires a three-course minimum and up to 12 courses if you desire. The table seats 12 and is open on Friday and Saturday nights. Visit dawtmill.com (and be sure to check the website for driving directions to the restaurant). Take a quick and easy day float on the James River. It’s perfect for paddlers who are toting kids, who aren’t up for an all-day trip or who don’t want to venture too far from the city. Any direction you go you’re very likely going to run into a lake, river or creek. But if you’re looking for a quick day float that’s close to home, the James River is a great place to get wet and navigate a few ripples. A popular stretch full of wildlife, gravel bars, rope swings and a few swift rapids is the 7-mile Shelvin Rock to Hooten Town float. Shelvin Rock is located southwest of Nixa and is a public fishing access and boat launch ramp. Rent a canoe or a kayak from Hootontown Canoe Rental (1254 Hooten Town Rd. ; 417-369-2266). (Note the difference in the spelling of the town versus the business; this is not a typo, it’s just how they spell it!) Canoes are $35; kayaks are $30, including the shuttle. Visit hootontowncanoe.net. Afterward, grab a home-cooked lunch or dinner at River Smokin’ (1167 Hooten Town Rd. ), the restaurant across the street. The food here is homemade, from the soups and the hand-cut and breaded onion rings to in-house smoked meats. Open daily except Wednesdays. Check out the website at riversmokin.com. If you have time before heading home, check out the Mountain Springs Trout Farm or the Two Rivers Bike Park, both within a four-mile drive of Hootontown Canoe Rental. 1. Experience the peace and serenity of a hot air balloon ride. Balloon Sport USA in Joplin boasts 20-plus years of experience. Flights are scheduled at sunrise or a couple hours prior to sunset. Cost is $200 per person. 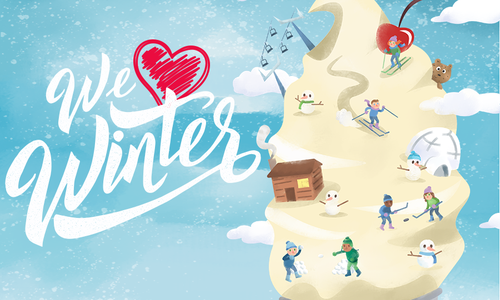 Ask about the “Sweetheart Flight” if you’re thinking about proposing. Visit balloonsportusa.com or call 417-865-0800. 2. Take a scenic tour of 417-land from one of Chopper Charter’s helicopters (3005 W. Highway 76). Kiddos are welcome, and choppers will hold up to three passengers. Or, make it a romantic evening and surprise your sweetheart with a flight to and from dinner! Visit choppercharter.com or call 417-332-1545. 3. Go parasailing! You can make reservations through State Park Marina in Branson (417-334-2628). Kids 5 and older are welcome, and up to three can go at a time. 4. Airplane rides at Hangar Kafe in Miller are a fun and affordable option for getting airborne. And, you can grab lunch at the restaurant, which is located inside an actual hangar! Call 417-452-2277 to schedule a flight (usually 24 hours notice is all they need). Cost is $25 for adults or $15 for kids, and the flight is usually about 20 minutes long. 5. If you’re looking for the ultimate thrill, check out one of the many skydiving options in 417-land. Call Ozark Skydive Center at 417-882-5867 (freefallexpress.com); or Skydive Missouri at 417-316-0383 (skydivemissouri.org). 6. Go flyboarding! This new water sport is catching on at State Park Marina (380 State Park Marina) in Branson. With water jets strapped to your feet, you can literally “fly” over Table Rock Lake Iron Man–style. You must be 15 years or older to try it. Cost is $79 for 20 minutes for a first-time flyer. Visit flyboardbranson.com or call 417-242-1359. 7. Go ziplining! Branson Zipline offers lots of tour options, including the thrilling Blue Streak Fast Line and Freefall Xpress tour that includes a 100-foot freefall drop. Call 800-712-4654 or visit bransonzipline.com. 8. Sign up for flight training at Baugh Flight Park and take the first step to getting your sport pilots certificate. Introductory flights on one of the powered parachutes last from 20 minutes to one hour. Visit baughflightpark.com or call 417-825-5353. 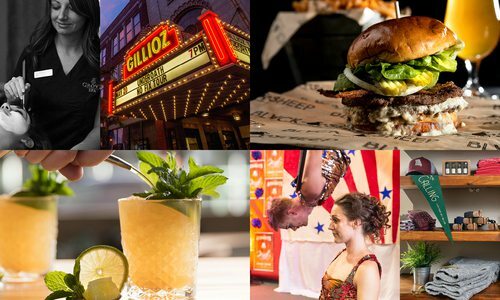 Spend the day exploring downtown Springfield with your better half. Grab a coffee from The Coffee Ethic (124 Park Central Square; 417-866-6645) and a donut from Hurts Donut (320 Park Central Square; 417-600-6106)—we like the sugar-coated donuts with Nutella centers. The apple fritters are huge and also very tasty. Snag a spot on the Square and enjoy this mid-morning snack and some downtown people watching. When you’re ready to start moving, there are shops downtown for any taste and style. Check out Five Pound Apparel (South Avenue, 417-368-6401) for T-shirts, jewelry and gifts. Get lunch at Grad School (434 S. Jefferson Ave.; 417-866-8163). Order the Full Ride, a double patty burger with lettuce, tomato, caramelized onions, bacon and soft sharp cheddar. Head over to Tropical Liqueurs—aka Trops (420 S. Campbell Ave.; 417-501-1771) and giggle about your ice skating escapade over a huge frozen adult beverage. Check the website in advance for drink coupons and specials served daily from 3 to 8 p.m. If you’ve timed it right, you can catch a movie on the lawn at Mother’s Brewing Company (215 S. Grant Ave.; 417-862-0423). They partner with the Moxie Cinema on the fourth Friday of every month to put on this summer series. Cost is $5; folks 21 and older are welcome. The movie starts at dusk (around 8 p.m.). Be sure to bring lawn chairs or a blanket. There is usually a food truck on-site and beer from the brewing company for purchase. You’re also welcome to bring your own non-alcoholic drinks and food. Visit mothersbrewing.com. Note: We’ve mentioned several stops for adult beverages on this day date, so please drink responsibly and plan lodging for the night so you don’t have to drive home. If you want to make this a perfect day and a perfect night, spend the night at the Hotel Vandivort (305 E. Walnut St.; 417-832-1515). Visit hotelvandivort.com for rates and availability. Leave the kids with a sitter, mix up a pitcher of something spiked, and get out on the water for a day with friends. 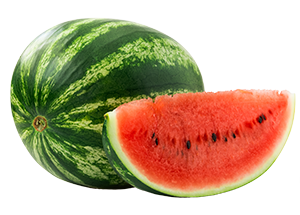 Put all the meat from a seedless watermelon into a blender until smooth. Strain, discard the pulp and blend the watermelon juice (about 8 cups) with the juice of four limes. Add simple syrup if you like it sweeter. Add cucumber vodka to taste. Serve with mint leaves and cucumber slices. You’ll want the perfect sunnies, stylish sandals and one of those high-neckline swimsuits everybody’s talking about. Make sure you also get your hands on a “Lake Hair Don’t Care” ball cap from Torn Boutique (tornboutique.com). These colorful caps sell out quickly once summer hits, and they’re perfect for covering up windblown locks with a little sense of humor. A super-fab lake day calls for some super-fab provisions. Take advantage of summertime fruit by whipping up a peachy or watermelon-filled cocktail to quell the summer heat. You can prep some Berry-Peach Sangria or Watermelon Refresher at home, and bring it in a big shareable container to serve over ice. You don’t just need a boat to rent. You need a yacht. You need a captain and a first mate to do all the work, so you can just soak up the sun and relax. For that, you need to contact TableRock Luxury Cruises (tablerockcruises.com). The cost of fuel is included, and if you’re not up for rustling up your own grub, they’ll even cater your trip. You can easily find a quiet cove where you can relax on Table Rock Lake, but there are also a handful of popular spots that offer a little something extra. If you want to see some pretty bluffs, head to Point 25. People love to climb to the top and leap down into the water. We don’t know how safe (or legal) this is… So we’re officially not recommending it. Make plans to round out your day by docking up at Big Cedar Lodge for a meal with a view. You can walk or shuttle up from the marina to Devil’s Pool Restaurant (bigcedar.com), where you can fill your bellies with hearty treats like fried chicken, grilled trout and juicy burgers. Try to get a seat on the patio or near the windows, so you see the lake while you eat up and sip a cocktail. Bike rental, lawn games and plenty of shade make Sequiota Bike Shop the perfect fuel stop for a boozy bike trip. Take the whole family on a kid-friendly bicycle trip down Galloway Creek Greenway, and enjoy the scenery, Sequiota Park, a little art and some tasty food along the way. Start your journey by parking at Pershing Middle School in Southern Hills and riding across the street to the entrance to the greenway. From there, you can take a nice, shady ride all the way to Sequiota Park and enjoy the scenery that the greenway offers. The greenway keeps on going past Sequiota, but the park is the perfect place to make a quick stop and let the kids run wild. There are a couple of small playgrounds there, but the real fun comes in climbing around on the rocks near the cave entrance, watching the ducks and geese glide over the scenic lake and walking on the trail that circles the lake up in the woods. By now, the afternoon heat is probably making you dream about air conditioning. Hop back on the greenway trail and ride down to Firehouse Pottery (firehousepottery.com), where you can bask in the A/C while you and the kids spend a little time painting pottery. Leave your works of art to be fired, then hop back on the trail. Galloway Creek Greenway meets up with the Springfield Conservation Nature Center at the very end of the trail. Lock your bike to the racks at the end of the greenway, and head to the nature center trails on foot. They’re a great place to spy some deer, foxes, turtles and more while you enjoy a little time in this nature oasis. By this point, you’ve probably burned off those lunch calories and need a little fuel to get you back to your starting point. Head back down the greenway the way you came, and make a stop at Galloway Grill (gallowaygrill.com), where you can munch on something as healthy as edamame or hummus with veggies, or as indulgent as a giant burger with fries. 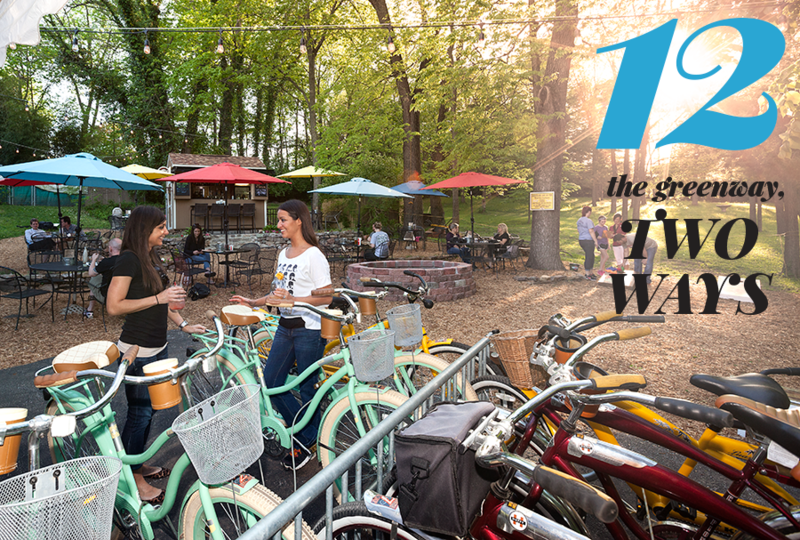 For a more grown-up trek down the Galloway Creek Greenway, make sure you stop at all the eateries along the way that serve up adult beverages along with tasty food. It’s a food-filled outing that’s not for the feint of heart. This grown-up trip down the Galloway Creek Greenway should begin with lunch at Galloway Grill (gallowaygrill.com). Don’t fill up too much; you have lots of food ahead of you! Opt for a light lunch and a cool glass of your favorite brew. After that first snack, hop on your bike, cross the street and get on the Galloway Creek Greenway. You’ll barely have to bike at all before you get to Creekside Bistro. This little spot has a back patio that overlooks Galloway Creek, so it’s the perfect spot to enjoy the summertime weather with a drink in hand. Make arrangements to meet some friends at this stop; it’s perfect for taking your time because that scenic patio feels oh-so-private. 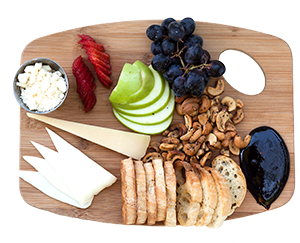 The fresh fruit and cheese board from Sequiota Bike Shop is a light complement to a refreshing afternoon drink. Back to the trail! Next stop is for happy hour. At Sequiota Bike Shop, you can sit on the lovely back lawn, join in some happy hour lawn games and leave room for dinner by snacking on a fruit and cheese board. If you’re up for it, opt for a spiked slushie or hard root beer float while you’re there. It’s time to digest. Park your bikes at Sequiota Park right across the street from Sequiota Bike Shop, and find a cozy park bench where you can take a little rest in the warm summer sun. Or walk around the sidewalks and trails while you take a much-needed break from the uber-indulgence of this day. It’ll be the exercise that makes a little room for your next tasty stop. End your foodie trek at a place that serves up mighty portions of tasty pasta. Bambino’s Cafe (bambinoscafe.com) is located at Lone Pine Avenue and Battlefield, so you’ll have to veer a little off the trail to get there. Park your bikes outside, and head in for a glass of wine and steamy plate of The Poppa and its killer spicy tomato cream sauce.